Candida TV logo Supervideo, our SuperHero who narrates the terrible days of the G8 in Genova 2001. The wish to live, to live differently from the way we are forced to live in our everyday existence, to discover different kinds of wishes, is one of the more elegant definitions of art that exists on the margins of politics. The Italian artist, writer and videographer Agnese Trocchi in the MaMa net.culture club, Zagreb, presented one of such possible alternative worlds to us. She acquainted us with the activities of the so-called autonomous group Candida TV. This audio-visual underground culture group modelled its programme along the lines of creative unveiling of the malignant manipulative power-holder: television. Trocchi: As a group working on the production of independent video concepts, Candida TV was founded in 1999. It was based on different experiences: street performances, independent radio stations, occupied social centres or some other revolutionary activities. Working together at the underground film festival in 1999, we came to the conclusion that the moment for taking part in the TV programme was favourable. At the local TV-station in Rome, they asked us whether we had any material that could be broadcast. We decided to accept a contract according to which our material will be broadcast within the local programme, for nine subsequent weeks, an hour a week. We called our programme Candida show, wishing it to be more pop than the pop ones. It is actually about some kind of supremacy of pop culture, intensifying the language of television to the maximum, so that we could take it to its limits. Trocchi: The usage of tactical media means the usage of the already existing instruments in order to send messages or achieve goals different from the ones the medium itself is used for. We do not use the medium, we are the medium. Candida identifies with the instrument itself, we are television and we circulate messages that disturb and change the spectators' usual perspective. In this way we stimulate criticism, we create visions of multiplied reality. Our programme is: make your own television! to have the experience of communication, but on the underground level, directly, socially. We create events in the streets and the videos, short films etc. are based upon them... We go into the streets and create television, we invent happenings in which superheroes interact with passers-by. 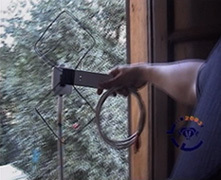 "How to build your own antenna"
December 2003, Geneva "Wsis? We seize!" event about the World Society Information Summit. Candida TV with different mediactivists all over the world setting up a video stream called "Highnoon"
Trocchi: Our production from 2002, called Super Video >>> G8, (the well-known Genoa conference) is a reality fiction, our intention is to show possible ways of narrating reality. While documentary films want to display reality as it is, we know that everything that is videotaped manipulates reality, this is why we rather choose to tell stories, create fiction and construct our own visions of reality. Our intention is to open the door to everybody, so that everyone might be able to broadcast his own, multiplied visions of reality. This is the only way to surround a void, which is the essence of things. So, reality and fiction are two elements interwoven in our visual productions, creating visions of possible worlds. 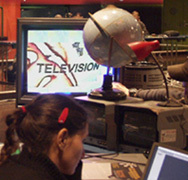 Q:The Candida TV programme also included the interview with Ricardo Dominguez, a representative of the famous American activist group Electronic Disturbance Theatre. The activity of this group is directed exclusively at the world wide web, hacker performances like the Floodnet, electronic floods that cause sudden server overload while browsing the pages of big world banks or multinational corporations. Trocchi: Meeting Electronic Disturbance Theatre was very important for us, because it clarified certain elements of our own work. We edited the interview with Dominguez with the street actions scenes from previous years: they are as screenplays, which use the city as a theatre. When power suddenly walks on stage it shows itself for what it really is.So we create a fiction, which incorporates different forms of power and makes them visible. Electronic Disturbance Theatre has given us elements to analyse our own work. Q: One of the procedures in the Candida TV programme is base on the practise of “reverse engineering”: the way of using a tool is reversed. An important aspect in the activities of independent television is reversing the roles, turning spectators into creators with the intention to radically remould the perception of media, which means eliminating the prejudices about its non-interchangeability. Instead of one-way communication, from one to many, Candida stresses the communication going from many to many. Trocchi: I would like to point out the importance of laboratories for alphabetisation in audio-visual language, especially among young people from the suburbs. We play the game of television, it descends from its throne to the streets, where it came from, because if television killed the streets, we return it to the site of the crime. For a few months, we have been doing workshops about the use of: TV cameras, editing software… Together with those young people, we tried to imagine what their television might be like. During that game we learned to deconstruct the language of television and construct a new one – our own language. With the Telestreet network and the Guerrilla Marketing crew the Sky project was carried out in 2002: a football match between Roma and Lazio telecast by the Sky Channel was stolen and brought back to the people by means of street television. This was actually a Robin Hood style action, because something shut off and inaccessible was taken and made available to the masses – because football is absolutely a public matter. At the same time, this gave us a chance to access the collective body of images, because everyone watches sports and street television spots were inserted in the half time break. Trocchi: That declaration was written in 1999 as a playful, provocative manifesto. It is about very broad and very underground cultural production, independent press and radio…which together with Candida try to penetrate into mainstream media space. This is a programmatic declaration bringing into doubt everything, which is coming from the media, everything people believed in. Q: Considering Candida’s performances regarding the exposure of the media manipulation strategies in the first place, it is impossible not to notice the connection with last century’s avant-garde movements like dada or surrealism. In spite of the clearly expressed critical engagement, Candida skilfully evades socialist-realistic dogmatism, charmingly uncovering the political reality by nonsensical humour.